Our ancestors have fought for our right to vote and we should acknowledge our appreciation by exercising our right in every election. There are a number of people who believe that their vote doesn’t count and they refuse to vote. I strongly urge you to make your voice count and go vote in the presidential election on Tuesday November 8, 2016. There is a lot at stake in this election and we need the perfect CANDIDATE TO BE ELECTED. 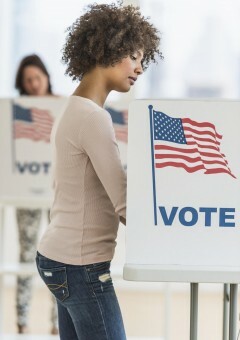 We at Urban Girl Magazine care that our 15th amendment grants African Americans the right to vote, and we encourage you to actively register to vote for the Presidential Election in November. Every state has their own Voter Registration deadlines. GO CHECK YOUR STATE’ S Deadlines IF YOU ARE NOT REGISTERED TO VOTE. TODAY, OCTOBER 18, 2016 is the last day to register to vote in the state of New Jersey, New York was October 14th, and California is October 24th. To find out your state’s deadline for voter registration, just google it. 2. At least 17 years old, and understand that you may not vote until reaching the age of 18. 1. You are serving a sentence or on parole or probation, as a result of a conviction of an indictable offense under state or federal law. Important to know: If you are no longer serving a sentence, or no longer on parole or probation, you CAN vote. The New Jersey Voter Registration form is located online and at your local county offices, or even in your local city or town hall. It’s important to note that you can not submit the voter registration online you can only print it out and mail it in. If you live in another state check your state guidelines and deadlines. Every vote count, so please vote! !